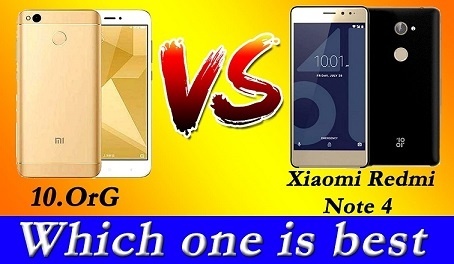 Since the Launch of Chinese firm Huaqin Technology 10.Or G. The smartphone market has just scatted and everyone is talking about Note 4 From Xiaomi and 10.Or G.
first 10.or G smartphone in India. comes in two memory variants – the 3GB RAM + 32GB storage variant priced at Rs. 10,999, and the 4GB RAM + 64GB storage variant, which is priced at Rs. 12,999 INR. Available in Go Grey and Beyond Black colour variant. This phone have a 5.5 inch Full HD display with resolution of 1920 x 1080 px. Powered by 1.1 GHz Octa-core Snapdragon 626 processor paired with 3GB/4GB RAM and 32GB/64GB internal memory which can be expanded up to 128GB via microSD card. The battery backup of the phone is 4000 mAh which claims 540 hours battery survival on standby, consist of two 13-Megapixel rear camera with dual LED flash and 16-Megapixel front camera. . The device runs Android 7.1.2 Nougat On board according to the company announcements it will be up-gradable to Android Oreo as well. It also features dual SIM with 4G VoLTE support. Xiaomi Redmi Note 4 was launched in August 2016. The phone comes with a 5.50-inch non HD display having resolution of 1080×1920 pixels at a PPI of 401 pixels per inch. Xiaomi Redmi Note 4 price in India starts from Rs. 10,999.The Xiaomi Redmi Note 4 is powered by 2GHz octa-core Qualcomm Snapdragon 625 processor and it comes with 4GB of RAM. The phone packs 64GB of internal storage that can be expanded up to 128GB via a microSD card. As far as the cameras are concerned, the Xiaomi Redmi Note 4 have a 13-megapixel rear camera and a 5-megapixel front shooter for selfies. The Xiaomi Redmi Note 4 runs Android 6.0 and is powered by a 4100mAh non removable battery.The Xiaomi Redmi Note 4 is a dual SIM (GSM and GSM) smartphone that accepts Micro-SIM and Nano-SIM. Connectivity options include Wi-Fi, GPS, Bluetooth, Infrared, USB OTG, FM, 3G and 4G (with support for Band 40 used by some LTE networks in India). Sensors on the phone include Compass Magnetometer, Proximity sensor, Accelerometer, Ambient light sensor and Gyroscope.